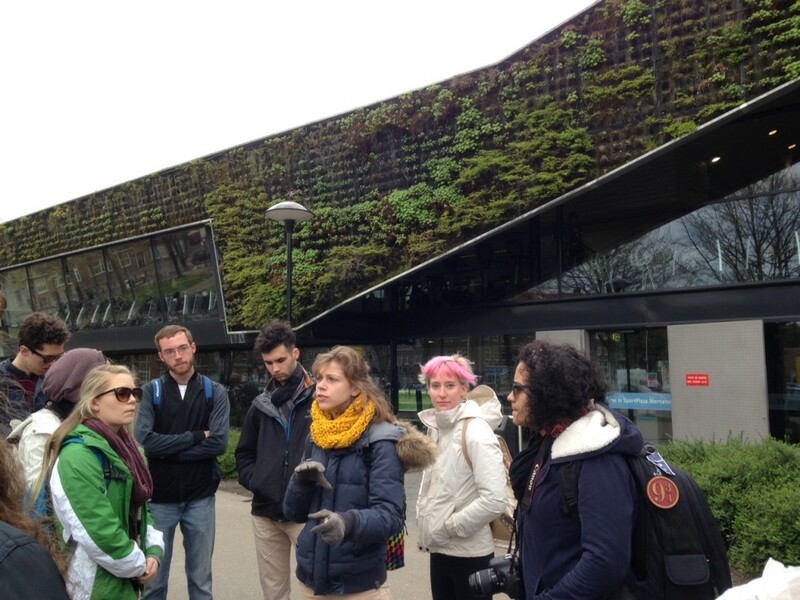 Sustainable Amsterdam recently hosted a group from the University of Alabama at Birmingham for a study abroad program. 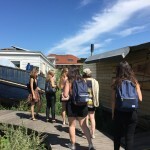 This multidisciplinary group of students with backgrounds varying from engineering to public health and sociology wanted to explore historical and current approaches for sustainability in the Netherlands. We worked with the group’s professors to develop a program focused on three key themes — water management, sustainable buildings and food access. The program allowed students to learn through experience and interaction. 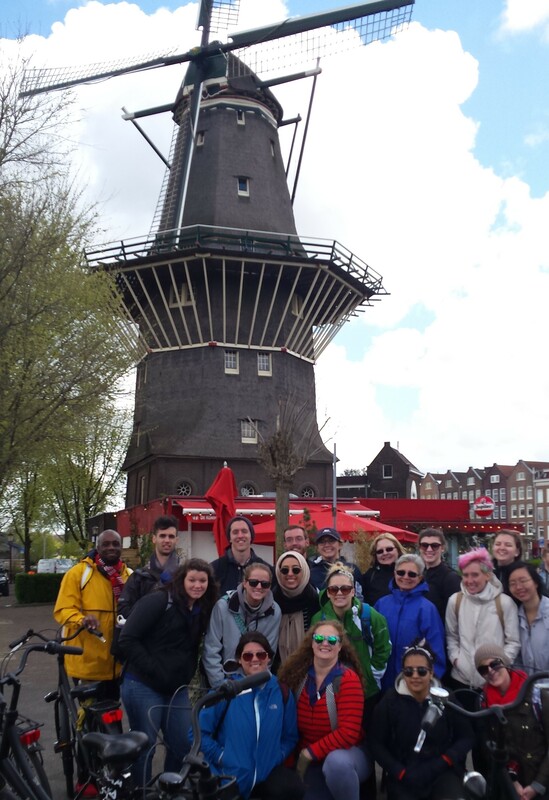 University of Alabama at Birmingham tours the east side of Amsterdam on bikes. Photo credit: Anna Hajdu. On the first day, we biked through the East side of Amsterdam. We began by exploring how land scarcity resulted in a spatially efficient, dense city. Looking down at the city’s oldest canals, we discussed how Amsterdammers have managed water, drainage and floods for over 800 years. Students noted how permeable pavement such as cobblestones and green areas are simple but highly effective ways to manage water, and wondered why these low-tech solutions are so often ignored in discussions focusing on high tech, expensive options. We looked at the city’s foundations. Buildings have to be erected on wooden piles to prevent them from sinking into Amsterdam’s swampy ground. The existence of so many old structures raised questions of sustainability. If a four hundred year old building is still in use, is that sufficient to deem it sustainable? Or should it meet certain standards for energy consumption? Does a label guarantee sustainability, or is it more important that local zoning regulations allow or enable a variety of uses? And how do we evaluate the health impacts of buildings? On the second day, we explored markets in the West part of the city and saw how they bring the community together. At the organic market at Haarlemmerplein, students spoke with local producers about business and the environment. Henry from “Vis van Henry” explained how difficult it is to sell sustainable fish when people pay more attention to low prices. Later we visited De Hallen – a former tram depot redeveloped into a library, hotel, food court, artist studios and other spaces. The students compared the positive and negative impacts of this project to similar projects back home. On the morning of the third day, we took the ferry to Amsterdam North and explored NDSM, a former shipyard that is an emerging hotspot for creative industries. The students found it fitting that this dockyard is the location of a low cost student housing complex made of shipping containers and wondered whether this approach could be applied in their city. After looking at an industrial crane that functions as a luxury hotel, students discussed the trend of using the “creative class” to drive urban renewal. In the afternoon, students discovered a very different side to Amsterdam when they visited Bijlmermeer – a garden-city suburb built according to Corbusier’s ideas on light, air and space in the 1960s and 70s. The district consisted originally of high-rise, hexagonal blocks connected by a raised road network that covered “open spaces” reserved for pedestrians and cyclists. After the district suffered from high crime rates and other social ills in the 1980s and 90s, the municipality began replacing the high-rise blocks with low-rise buildings and merging motorized and non-motroized traffic. This example helped us see how today’s “sustainable and progressive” might be tomorrow’s failure. On their free days, students explored the city at their own pace, taking in the Van Gogh and Rijks museums, testing various eating options, and exploring Amsterdam’s numerous diversions. As the sun set on the fifth day, the group said goodbye and embarked on a barge that would allow them to bike through the tulip-laden Dutch countryside. 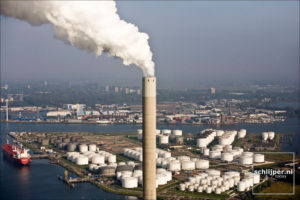 Their final destination is Rotterdam where the group will continue to investigate innovative approaches for sustainability. You can read more about the program, including students’ perspectives in this article, and below is a review by one of the program leaders. 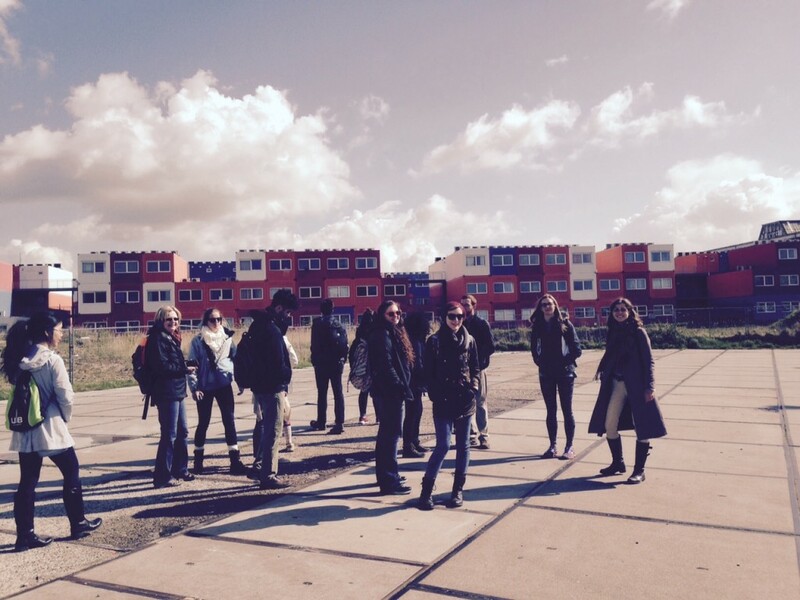 If you are interested in organizing a similar study tour in Amsterdam, then please contact Cornelia! 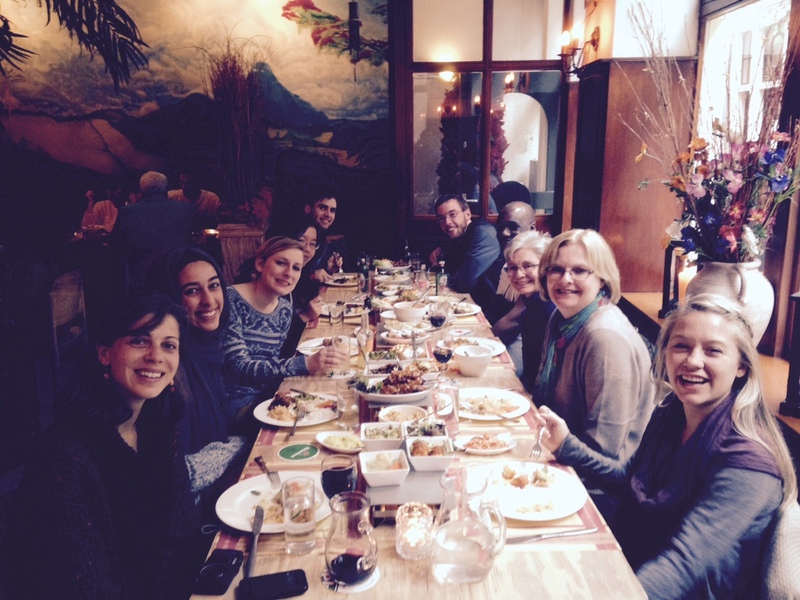 “As co-leader of a program including 17 university students from the United States interested in studying sustainability efforts in the Netherlands, I am so thankful to have discovered Sustainable Amsterdam and the expertise of founder Cornelia Dinca! Cornelia, and her assistant, Anna Hajdu, did far more than show our group of 19 the sites of the city. They immersed us in Dutch culture by offering us an inside look at how the Netherlands of today is built on centuries of history, art, and technological innovation. Cornelia and Anna led us through the city by bike, train, bus, and foot to discover the intricacies of planning for which the Dutch are known. 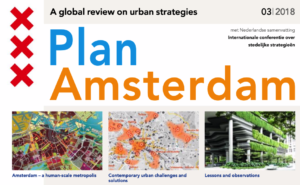 We traveled to fresh food markets, repurposed art communities like Noord, buildings constructed with green roofs and green walls, and innovative neighborhoods where residents are experimenting with new ways of thinking and living sustainably. Everywhere we went, Cornelia and Anna offered a wealth of information about all things Dutch—politics, food, use of private and public space, and (inter)national identity. 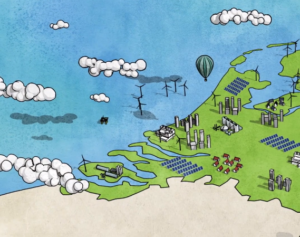 Throughout our time in the Netherlands, Cornelia and Anna made our journey our own. They asked us what we wanted to see and do, and what might make our visit to the country most meaningful. They delivered what we requested, and more. Since I was also conducting research while in the country, I also benefitted from Cornelia’s wide network of contacts. She was able to direct me to the people and places that helped me to accomplish my writing goals while experiencing the country alongside my students.